The holidays are fast approaching, and how many times do you have to bring in something yummy for a potluck at work, or a nice treat for a holiday party? I don’t know about you, but I have to do that all the time! Invariably there are little smokies in BBQ sauce, meatballs in some kind of sweet sauce, and then there are meat and cheese trays hurriedly put together with a pile of crackers. I never want to be the person that stops by the store to grab a package of premade “whatever,” but sometimes that’s all you have time for! Wouldn’t you like to be, just once, the person that made something so incredible that the guests couldn’t believe you whipped it up yourself? 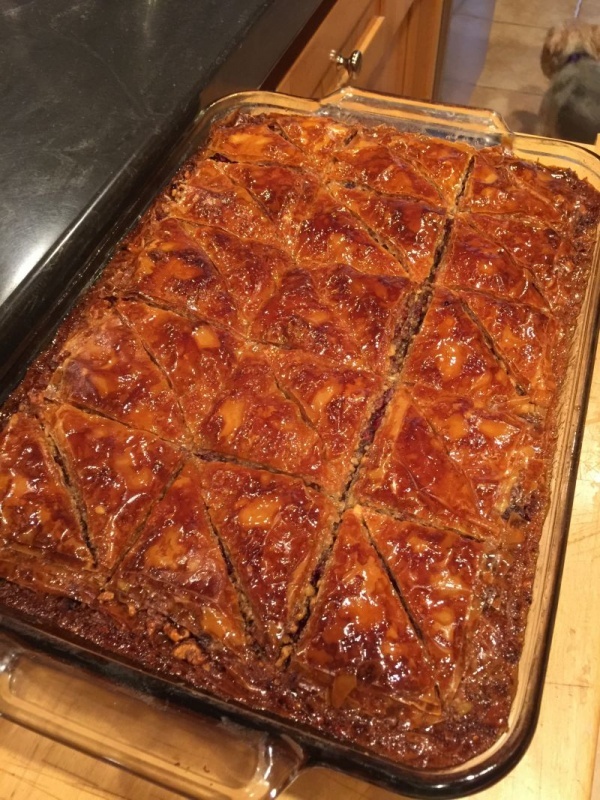 This week you are going to learn to make a middle eastern dessert, called Baklava. It originated in Turkey, and can be served cold, room temperature or slightly warmed. 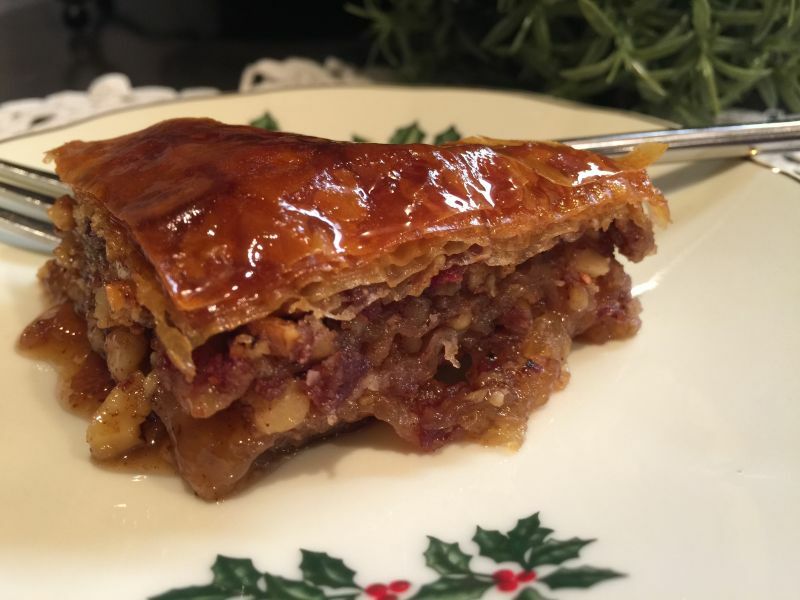 Delicious served with a hot cup of coffee or tea, this rich, sweet dessert pastry is traditionally made of layers of phyllo dough that are filled with chopped nuts and held together with honey! 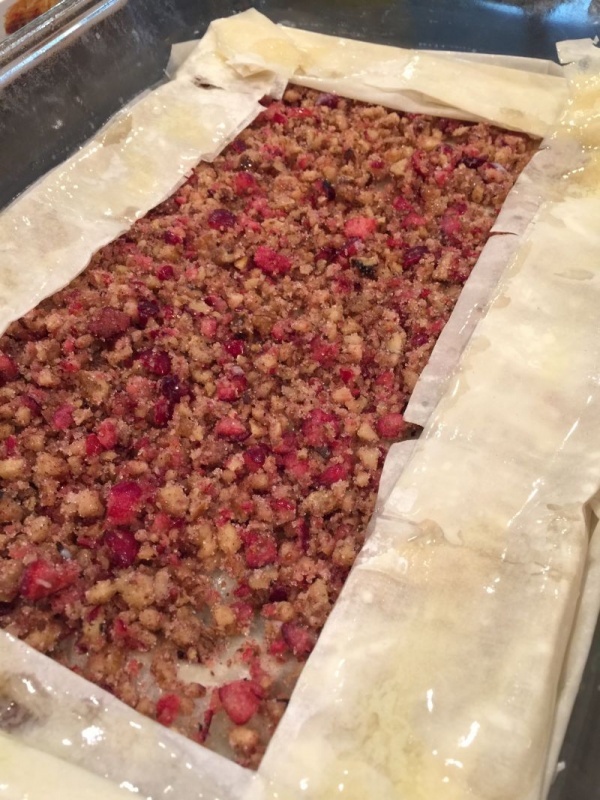 This recipe has a bit of a twist, and has the delicious holiday flavor of cranberries to pump the flavor up a bit! When I saw my girlfriend make these delicious treats, and saw how beautiful they turned out, I had to make them myself. Not only are they gorgeous, but they store beautifully, and you can even freeze them so they are ready well ahead of that evening get together you haven’t gotten invited to yet…and seriously, your friends are going to have a hard time believing you made them yourself since they have a reputation for being very difficult to make. Make a batch and divide it in two, and you will have a lovely plate to bring to separate events over the holidays…or place a couple of them on the cookie platters we all make to share with the neighbors…that is if you can keep your own fingers out of them! 1. 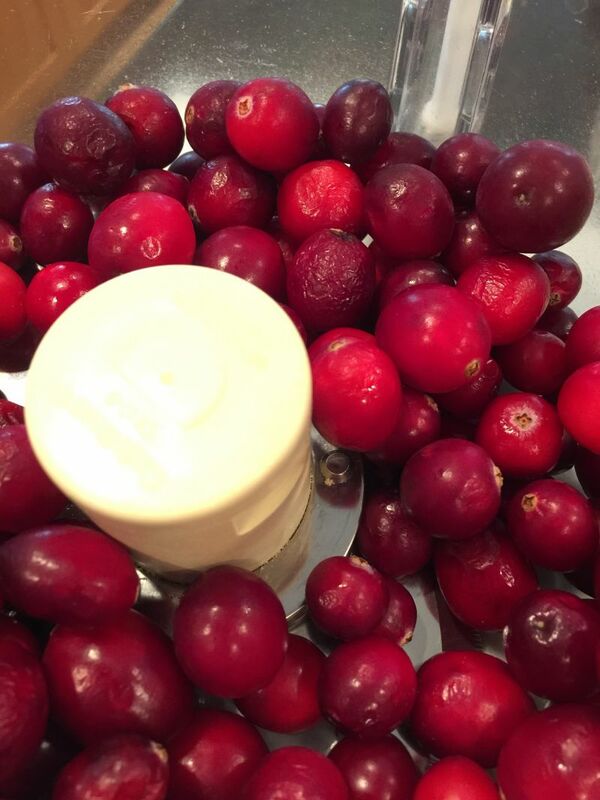 In a food processor, finely chop the cranberries and put in a large bowl. 2. 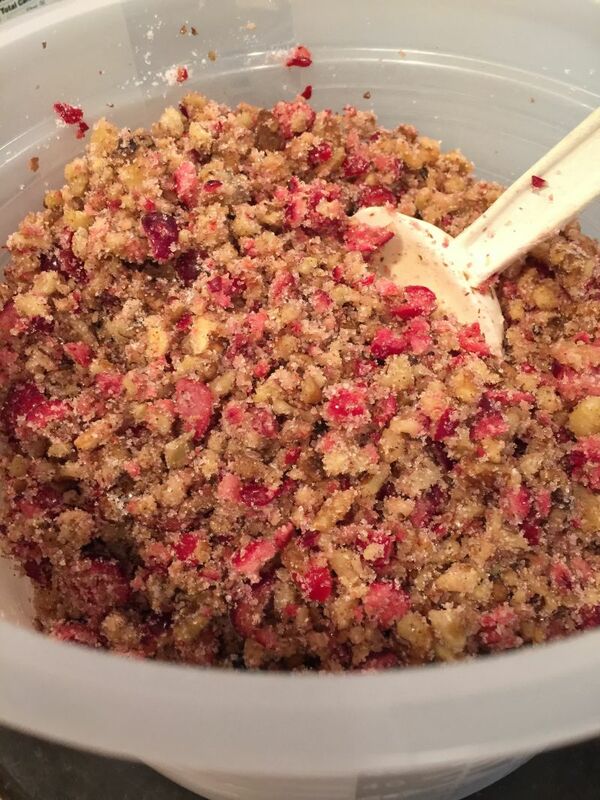 In a food processor, finely chop the walnuts and add the cranberries. 3. Add the sugar and cinnamon, and stir until everything is mixed well. Set aside. 6. 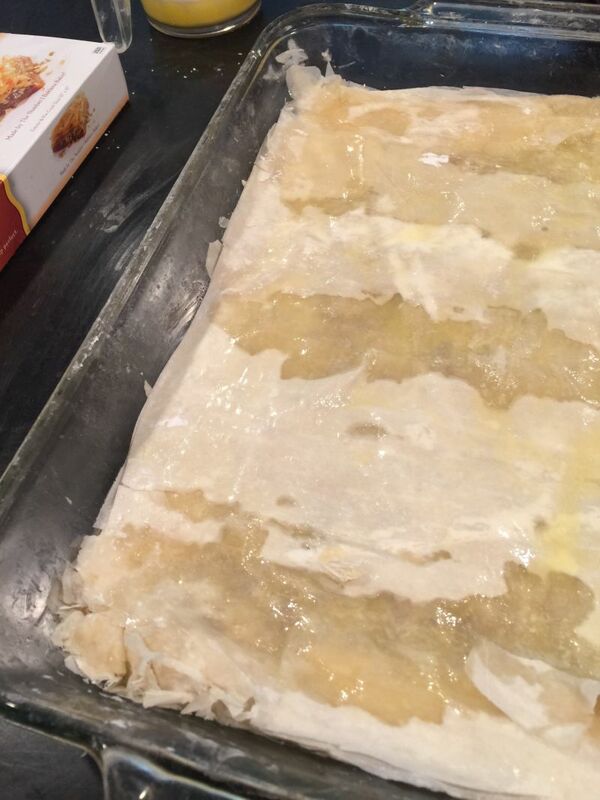 Place one sheet of phyllo dough in the baking pan. The edges will come up over the sides, but don’t worry about that now. Brush with melted butter. Repeat with 5 more sheets of dough, brushing with butter each time. 9. Again gently spread 1-1/4 cups of filling over the buttered dough sheets. Do Not fold the edges over this time. Just leave them hanging over the edge of the baking dish. 10. Repeat with 6 more sheets of dough, brushing each one with butter. 11. Spread the remainder of the filling over the buttered sheets. 12. 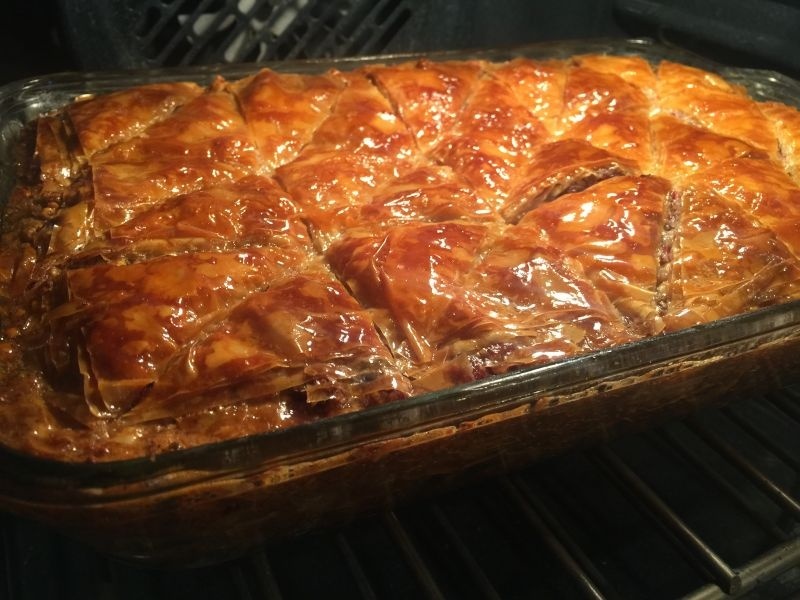 Use the remaining phyllo dough sheets, one at a time and brushing each one with butter. 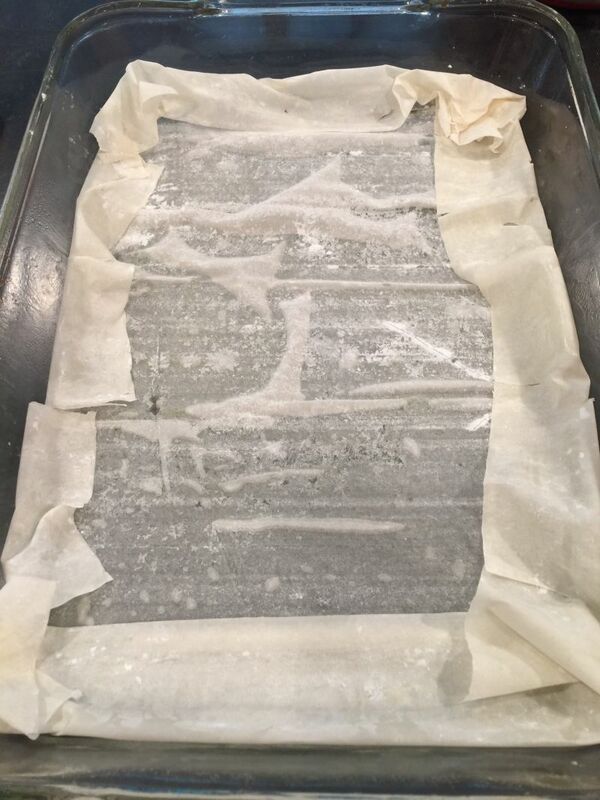 Using a very sharp knife, cut the edges hanging over the baking dish and discard. 13. Again using a very sharp knife, cut the baklava halfway through, into 15 squares. Then, cut each square diagonally, cutting only halfway through. 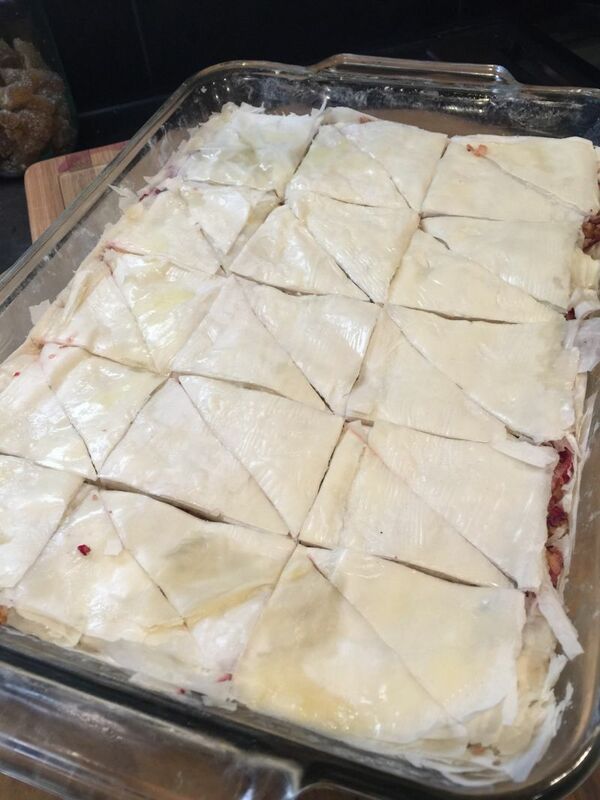 You may have to gently hold the phyllo dough in place with your fingertips as you cut diagonally, so it doesn’t move. 14. Warm the honey in a small pan or in the microwave, so that it is thin. 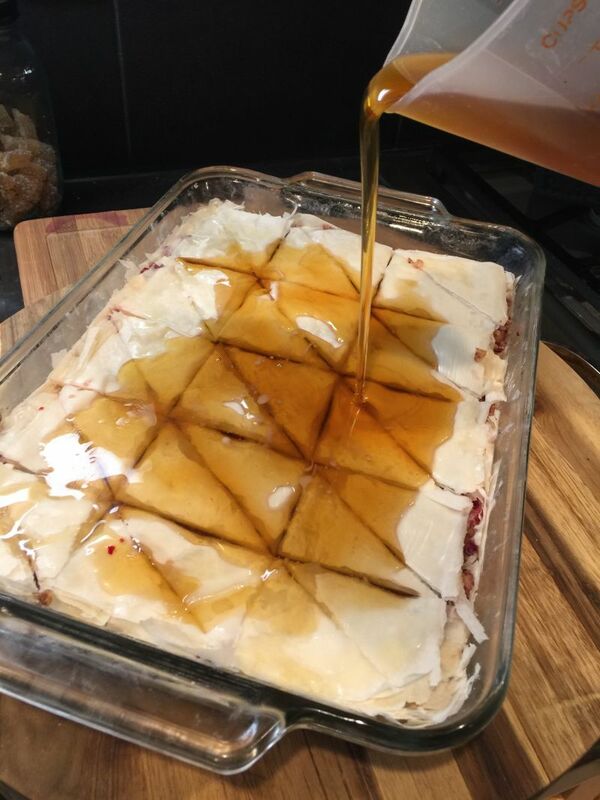 Pour the honey over the entire prepared dish, and spread with a spatula if needed to make sure it seeps into every crevice and around the edges. 15. Bake for 60-70 minutes. 17. Allow to cool, and with a sharp knife trace your previous slices and cut all the way through. You can serve it warm, straight from the pan, or place each triangle in a cupcake liner before placing on a plate to serve, or in a container to freeze. 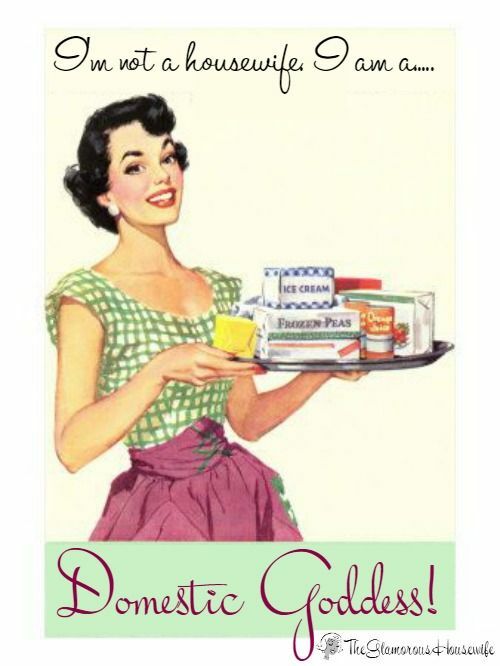 Makes 30 servings! I know this seems like a lot of steps, but it is essentially just repeating steps 6 and 7 three times. It’s very easy! And don’t worry if your sheets tear…no one will notice. Use them anyway! 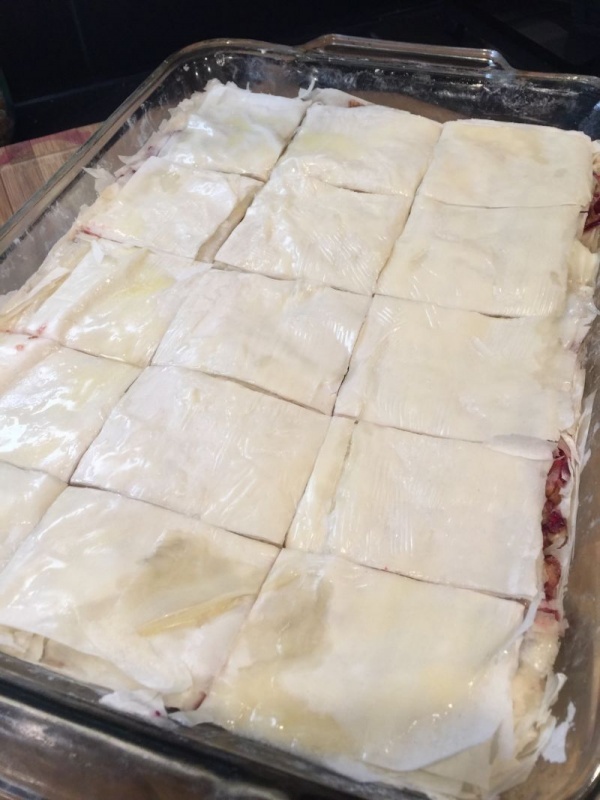 So a quick shout out to my girl, Heather Burcham, for sharing her recipe with me, even though I sort of changed the assembly a bit when I made it. I can’t wait to see your efforts, so please send a picture when you comment! California Girl Comments: You know, she never asks for MY comments. Especially the ones where I ask where my samples are! Sheesh! Just so you all know, I am in the same boat as you all are and I don’t get to eat this stuff either. The meanie! I love reading your recipes, I don’t take photos of my attempts because generally they need some practice… my skills are still in infant stage! But its fun trying and they really are easy to follow along, you make them fun so please never stop sharing! This looks so delicious. I can see why you say cut it in half. Half for you and half to take to the party! 🙂 I kept ready waiting for the honey! 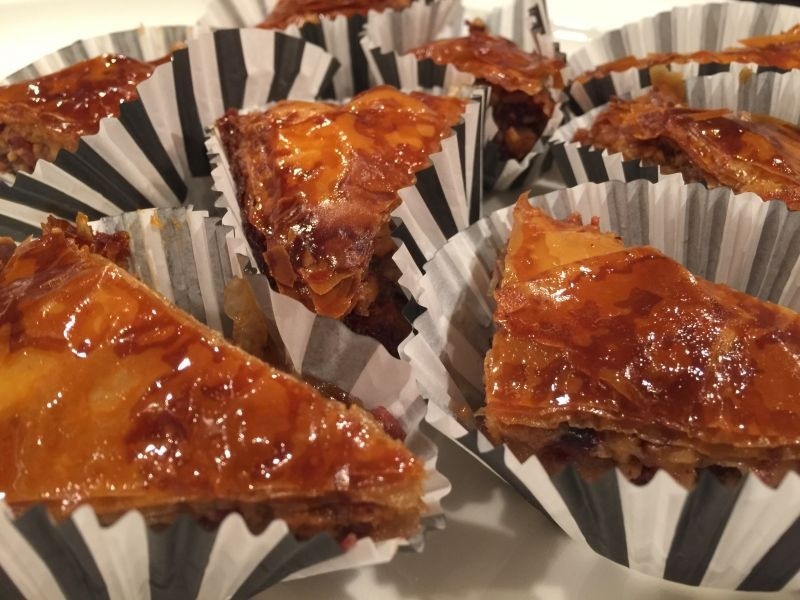 I love my baklava just dripping in honey. Thanks for sharing this great treat! What an ambitious project. Hats off to you. It looks divine.